In her Golden Globe acceptance speech, Silver Linings Playbook star Jennifer Lawrence thanked Harvey Weinstein for “killing whoever you had to kill to get me here”. I assume he didn’t literally kill anyone, but the creativity of The Weinstein Company’s business tactics have always rivaled the creativity of the films it so successfully distributes. One of those tactics is Slow Releases, aka Platform Release, and the latest example of it was the surprisingly very-successful Silver Linings Playbook. When I looked at its cumulative grosses six weeks after its release many months ago, I thought “$23M gross for an $18M budget – good for them for breaking even, but it’s a shame they didn’t make more”. But somehow that was only the tip of the iceberg, as the movie went on to make over $130M domestically. 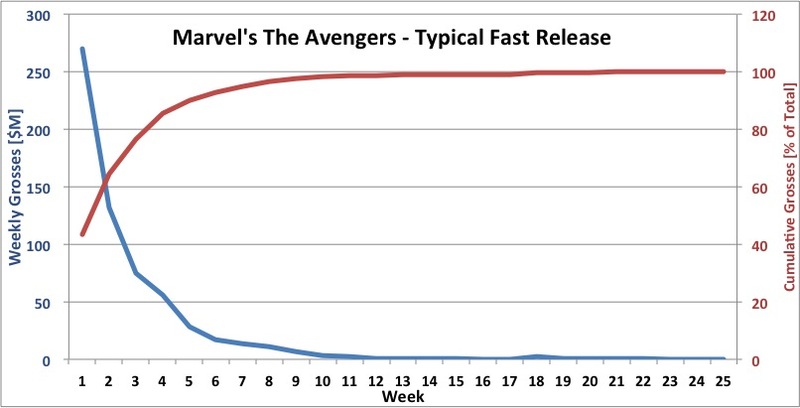 That’s amazing, since the vast majority of movies make 80% of their total grosses within 3-4 weeks from their release. It gives everything it’s got in the first week or two and then crashes – making over 80% of its total grosses in the first three weeks. That was the model I was using in my head when I thought Playbook was at the end of its run after six weeks. This is a completely different model. 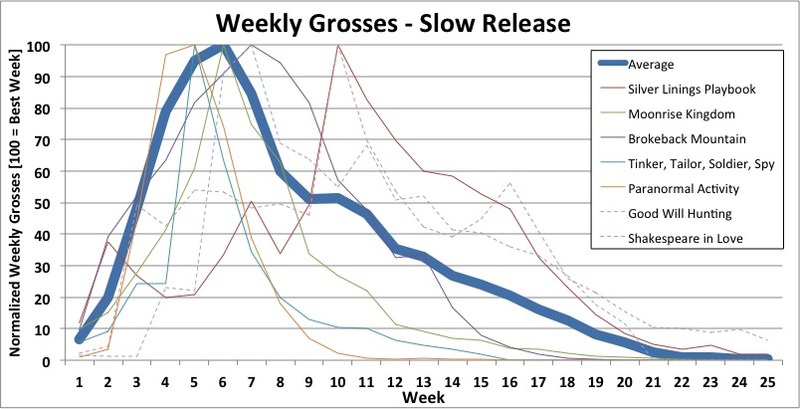 First, their weekly grosses reach their maximum only after a few weeks, and not on the first weekend. 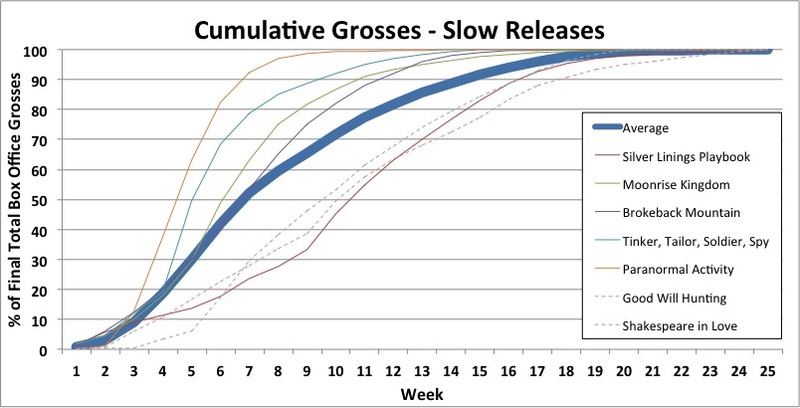 Second, they reach 80% of their total grosses only after 12 weeks! (Of course, there’s a bit of a variance here, but you get the point). So basically, Weinstein and all the other small-but-clever distributors are saying: “well, we can’t compete with the big studios’ marketing budgets so let’s use a kind of Bass model of brand diffusion [add link to wikipedia] and use indirect marketing (word of mouth, awards and general buzz) to gauge our distribution expenditures”. Of course this will work better with good movies, since they can hit an inflection point after which they self-propel themselves to success (like “Playbook” the six other movies in the figure above). But testing the market before blowing millions on marketing can also be beneficial if you have a flop on your hands: if you see it’s not gaining traction in 200 screens you can either pull it off the circuit and cut your losses or decide to give it a little extra boost with a proper marketing budget. « 20. DOES WORD OF MOUTH REALLY AFFECT BOX OFFICE PERFORMANCE?